Large - $74.99 X-Large - $74.99 Only 5 left! Channel your inner King of Pop. Work on your moonwalk and your best falsetto. Shamone! Pair with a single sparkly glove. Relive Jacko’s glory days when everybody loved him. Before any of that… listen, we don’t have to talk about it. We’re here to have fun! Nobody’s going to be asking any questions. Relive Michael’s early 80s glory days, dancing with Emmanuel Lewis and watching movies in his private theater at Neverland with Bubbles the chimpanzee, who Quincy Jones said was more fun than most people he knew. Don’t worry, you’re solo now, you don’t have to bring along Tito, Marlon, Jermaine or Jackie. Or Randy. Or Janet. La Toya. Rebbie. Can you name them all? If you really want to tell someone you don’t want to see their face around here anymore, this might be a subtle way to communicate it. Show ‘em how funky and strong your fight is. Neverland Ranch boasted attractions like a zoo, amusement park rides, and a train named C.P. Huntington. As of writing this, Neverland Ranch has been for sale for $100 million dollars for almost a year. Maybe you could get it! Why don’t you get this jacket first and sleep on it. It’s kind of a big decision. 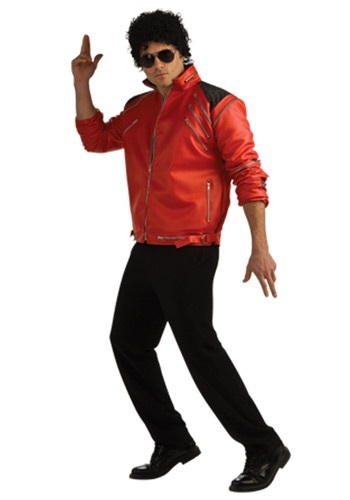 Our Adult Beat It Deluxe Red Zipper Jacket is red pleather with black patches on the shoulders. It has 19 silver zippers. Not 17. Not 18. That’s 19 zippers. That’s some Kingdom Hears level zipper action. Black shades, white socks, and a Jheri curl wig will complete the look. Also doubles as a Weird Al Eat It jacket for the White & Nerdy!